CNN -- The clash between Democrats and Republicans over the nation's economic crisis isn't just fueled by politics. It's also being driven, in part, by two competing views of history. 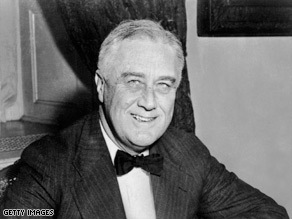 He was born into wealth, but President Franklin Roosevelt became a champion for the poor with the New Deal. President Franklin Roosevelt's New Deal traditionally has been credited with helping lift the nation out of the Great Depression. When Roosevelt took office in 1933, he pushed through the passage of a sprawling set of laws and public works programs geared to revive the economy. But there are some historians who say the New Deal not only failed to help lift the nation out of the Great Depression, it made it worse. We talked to two New Deal historians who represent opposing sides of this debate. Adam Cohen is the author of "Nothing to Fear: FDR's Inner Circle and the Hundred Days That Created Modern America." Jim Powell is the author "FDR's Folly: How Roosevelt and His New Deal Prolonged the Great Depression." Their remarks were edited for brevity. Did the New Deal help lift the U.S. out of the Great Depression? Powell: It certainly did not. The New Deal prolonged the Great Depression not because of one mistake, but because of a combination of policies that make it more expensive to hire people. Some of the time during the 1930s, the economy expanded, but chronic high unemployment persisted throughout the period. It averaged 17 percent. The best the New Deal could do was 14 percent (double what we have now), and at times, New Deal unemployment was over 20 percent. The chronic high unemployment is what concerns everybody. FDR might have lifted people's spirits, but he never could figure out how to promote the recovery of private-sector employment. So, how bad is the economy? Cohen: Yes, and in two different ways. One, it had a definite impact on the U.S. economy. From 1933 on, you saw a steady increase in the GDP [gross national product], which showed that it was helping with economic activity. You also saw unemployment going down. It is true that the Great Depression didn't end until World War II, with the [fiscal] stimulation it provided. That really suggests we just needed more spending. The New Deal was working, but we needed more of the New Deal. We needed more New Deal spending. People who say the New Deal didn't help also ignore the fact that the New Deal put millions of people to work. Ronald Reagan's father had a New Deal job. People could see actual progress on the ground. They could see the economy getting better. If people believe things are getting better, they start spending. What was radical about the New Deal when it was introduced? Powell: It involved the biggest peacetime expansion of government power in American history. So the New Deal was different, but I'm not sure one would call that radical. Was it radical to triple the tax burden, which is what FDR did between 1933 and 1940? Was it radical to destroy food and make three-quarters of the American population pay higher prices for food -- in the country's worst depression? That's what the New Deal did under the Agricultural Adjustment Act. Was it radical to make it more expensive for employers to hire people, triggering unemployment, as a number of New Deal policies did? Regardless of whether one would call such policies radical, I think it's fair to say that they harmed the people they were supposed to help. Cohen: When FDR took over, the federal government was limited in scope. It mainly defended the country from foreign enemies and delivered the mail. FDR reimagined what the federal government could be. It could be an employer of people. It could be a provider of relief payments. It could regulate the stock market. Those were things that no one thought the government should do, but terrible times allowed that. What can the New Deal teach us about dealing with the current economic crisis? Powell: The private sector creates all the wealth in any society. Government doesn't have any money other than what it taxes or borrows from people in the private sector. Everywhere, government has a dismal record of trying to operate businesses. During the 1830s, U.S. states got into the business of building railroads and canals, and they all lost money. Government-run Conrail (freight) and Amtrak (passengers) have lost billions. And of course, the Soviet Union collapsed under the dead weight of its government-run economy. Expanding the government sector doesn't promote recovery of the private sector. We need to make our priority the recovery of the private sector and private-sector employment. This means making it easier for employers to hire people -- removing obstacles that misguided government policies have been put in the way of forming new businesses, expanding existing businesses and hiring people. Taxes and labor market restrictions are among the many obstacles that need to be reviewed and reduced if not eliminated altogether. Cohen: What the New Deal showed is that the [federal] government could make a difference. The government could improve people's lives during terrible times and it could make an enormous difference in people's lives. What it argues for today is really bold action -- a large stimulus program of the kind we're getting, maybe even more. We need more jobs programs in which the government may have to be the actual employer and more programs that take money down to the people who need it most. The answer wasn't tax cuts then. It's government getting money into the hands of the neediest people. You do that, you save the people at the bottom who are the most liable of becoming destitute, but you also pump the economy.